Wow, sometimes your failures can be simply incredible. 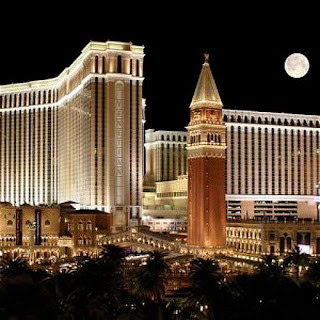 I was an absolute failure today in terms of executing a swing trade in Las Vegas Sands (LVS). Today's trade shows me precisely why return calculations based on "calls" are complete BS. One of the most difficult components of trading is the execution of your ideas. 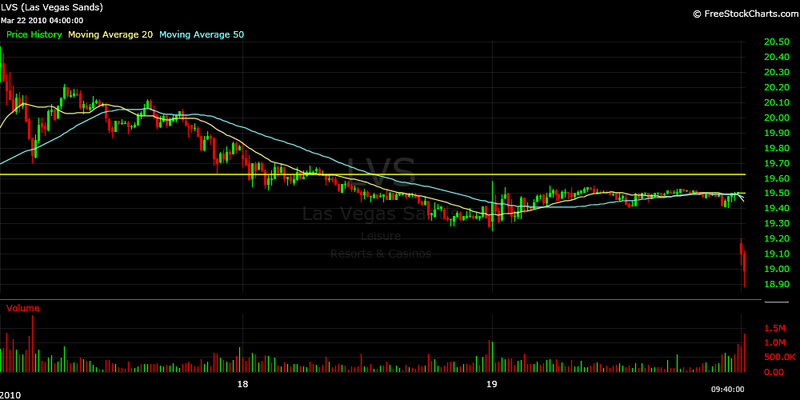 I could have told you LVS would be higher sooner or later and will probably trade up to $30 eventually. Yet, putting a solid trade on with good risk-to-reward can be damn hard! I had some success to start this month buying breakouts in some tech names and financials that I outlined two weeks ago. Yet, even with my successes in those trades, I was unable to put on sizable positions because I was primarily buying breakout levels. On my better trades I had a small position in the base and then added on the breakout. 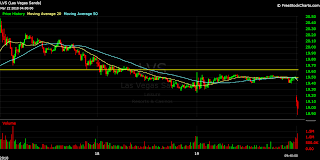 For this LVS trade, my goal was to begin buying on the pullback and add into the upswing allowing me to size up comfortably with quality risk control. 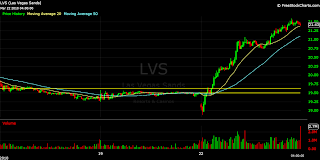 I starting buying LVS last week around the $20 area on its first pull-in. I've been watching the stock for a while looking for a breakout through the $20 level. The stock has no technical resistance to the upside until around $30 on a weekly timeframe so the move could be highly profitable for swing traders. Last week Tuesday saw a strong move higher and a close above $20. So, I started buying Wednesday on the first pull-in expecting the $20 level to hold roughly. I expanded my stops a bit and gave my position to $19 for a stop (a 5% potential loss). Shares continued pulling in on Thursday and I averaged down in my position around $19.40. I held my position over the weekend and into today's gap down. Today's gap down was discouraging but I still thought the stock had a good chance of quickly recovering and rallying positive. Knowing that whole numbers are foolish places to put stops, I smartly placed my mental stop at $18.90. Five minutes into the day the stock broke through $19.00 and dropped below $18.90 so I hit the bid getting my fill at $18.89 on my entire position. With my overnight losses and hitting out, I surpassed my maximum loss limit and my company's system locked me out of making any further trades for the day. The above chart was what I was looking at when I hit the bid. Nearly the entirety of last week's Tuesday move had been retraced and I had to adhere to my pre-determined stop loss. The low of the day turned out to be $18.88. I literally hit the bid one penny from the low of the day as the stock was trading down over 3% on the day. Shares turned and never looked back. 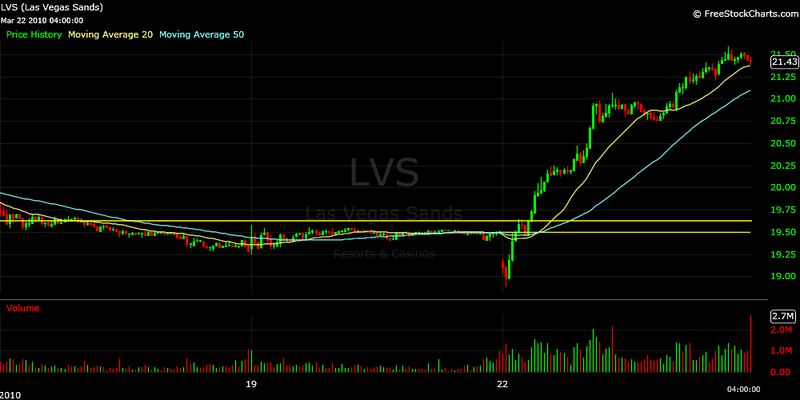 LVS rallied $2.50 (a 13% gain) from where I hit out. The stock ended the day 10% higher! All I can do is laugh. What a freakin' joke. All I can say is this trade was an epic failure. For the trade to work, the short-term selling pressure needed to be relieved. The break through $19 set off a flurry of stops and overhead selling pressure was taken out. I panicked right along with the pikers and lost my position and my ability to trade for the rest of the day. Frustrating indeed but I live to fight another day. So often stocks need some type of capitulation to reverse trends. Technical patterns need to break in order to work. It's amazing how often the majority needs to be wrong in order for the trade to work in the opposite direction. Oh well, what can ya do? I just needed to share my war story today because it was laughable, just laughable.